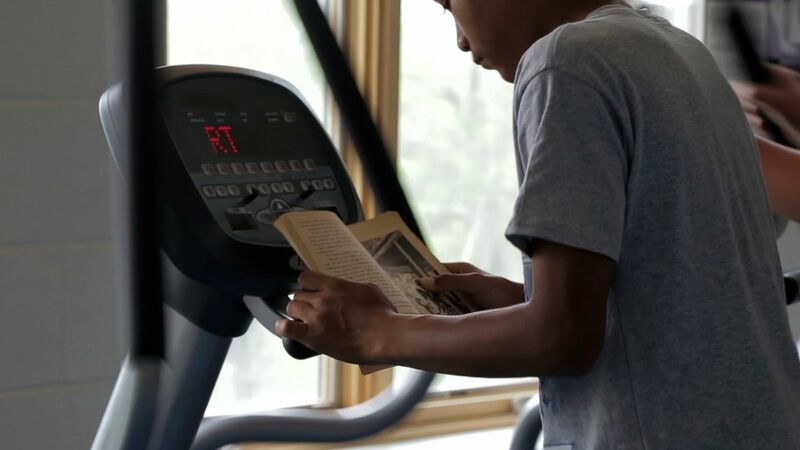 See how integrating language arts and fitness in one class boosts students’ cognition and mood. Fit Lit is Casey Middle School's fitness class combined with a language arts class. Students take a 45-minute fitness class followed by 45 minutes in language arts. Teachers have found that the right amount of movement before an academic class will help students focus and better retain information. Studies show that aerobic exercise boosts our capacity to retain information and the speed at which we take in and rework information. Anaerobic activity affects mood and helps to relieve stress, providing calmness and focus. Whether it's language arts, math, or science, movement can impact learning in any subject area abilities. Students are enrolled in the Fit Lit class five days a week. On three of those days, they take a 45-minute fitness class followed by 45 minutes of language arts. The other two days, there is a 90-minute block of either fitness or language arts. This arrangement allows teachers to be flexible with content and activities that are better suited for longer periods of time. Casey MS utilizes all of the space available to them, including the gym and the outdoor track and field. Activities include team sports, individual fitness challenges, group fitness routines, running, yoga, and stationary and elliptical bikes. The class usually starts with some kind of warm-up followed by a focused fitness activity. Go for a jog while discussing a book they are reading. Read while exercising on stationary bikes and elliptical machines or while stretching on a yoga mat. Exchange ideas and reflections with partners while walking around the outdoor track. Walk on their own while memorizing a poem. Teachers can get as creative as they want in finding ways to integrate fitness with their subject area. Regardless of the level of integration, the benefits of movement preceding any subject will benefit students. At Casey, Fit Lit class is co-taught by two teachers, both certified as language arts teachers, but also with a passion for fitness and fitness instruction. Having two teachers allows for a larger class size as well as more frequent small-group instruction. While one of these teachers has gone on to earn a certification in fitness, there are other ways to achieve this end. For example, a language arts teacher might partner with the current fitness teacher. Students can take the Fit Lit class as an optional alternative to their regular fitness and language arts classes. Any student is welcome to sign up, and no fitness levels are required. The ideal time for a fitness class is during the morning, followed immediately by the language arts class. This will give students the greatest benefit for the rest of their day, as morning exercise so often does. If the morning is not available, the basic structure of having fitness precede language arts is key to this program. The idea behind Casey's Fit Lit class came from research showing how exercise impacts the brain. Spark: The Revolutionary New Science of Exercise and The Brain, by John J. Ratey, is a foundational text in this area of research. Data is from the 2014-15 academic year.